Great for travel or study! 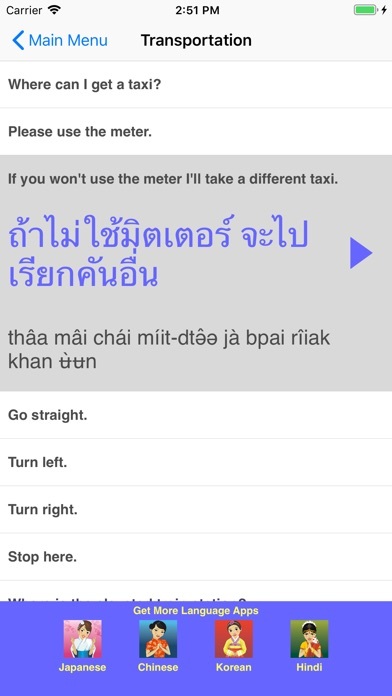 Speak Thai Travel Phrasebook is easy to use, with every phrase you need to enjoy your trip to Thailand. Each phrase is displayed in Thai script, phonetic transliteration, and English translation. 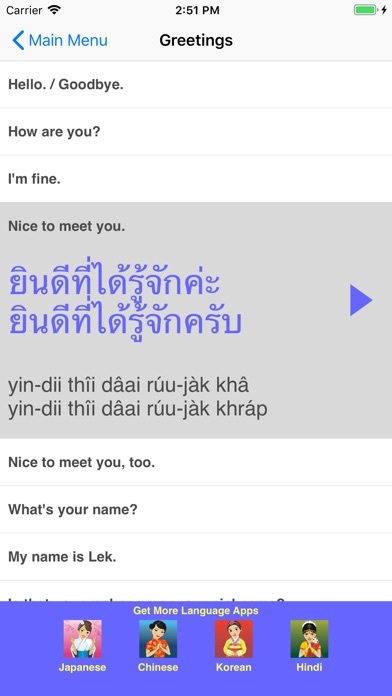 Hear the audio for each phrase in a clear, pleasant voice from a native Thai speaker. Separate versions of phrases for male and female speakers are recorded or indicated where appropriate. There are a total of 586 words and phrases in the following categories: * Greetings * Basics * Shopping * Restaurant * Hotel * Transportation * Places * Sightseeing * Health * Money * Entertainment * Numbers * Time * Weather * Fun Phrases Speak Thai Travel Phrasebook is great for anyone who is traveling to Thailand. You will sound nice and impress the Thai people you meet with these phrases. Sound smart by pronouncing Thai place names correctly. 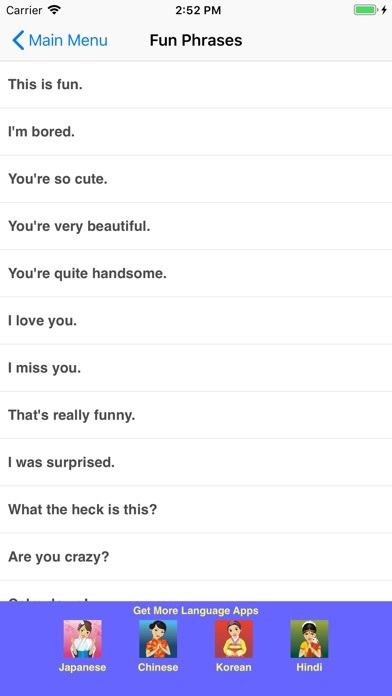 Try using some of the many phrases for ordering food the next time you go to your favorite Thai restaurant. Many phrases for ordering vegetarian food are included. Speak Thai Travel Phrasebook does not require an internet connection. You can use it anywhere you go. Love this app. It's really handy for travel. I was recently on a trip to Thailand and those was helpful. In those instances where I was unable to pronounce some phrases, i ised the screen as a pointy talkie and played the sound byte for people. It was handy. Excellent Thai language App. Easy to use. Speaks the phrases and writes so you can learn both! Very helpful when I visited Thailand. This does not work on my iPhone 5. Few minor issues sometimes the male doesn't speak but still a great app! 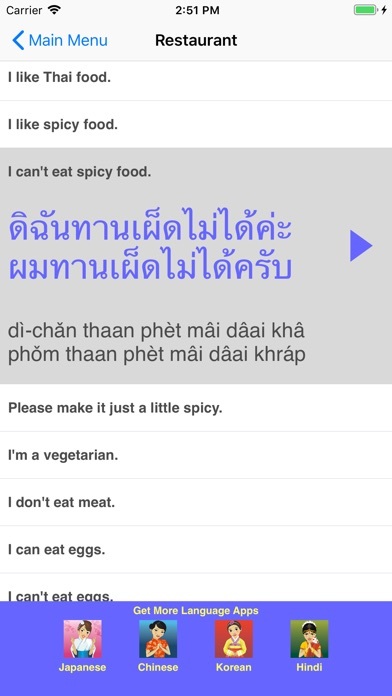 Practiced my Thai with this app and now in Thailand putting it to good use! Hope they update it and add more common terms. Very nice app. The recordings are very good and I appreciate the male and female versions . 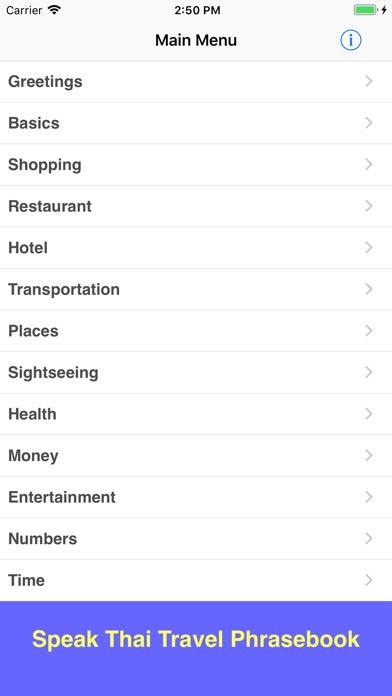 I would love to be able to search for a phrase or word in English and have the app return some options.